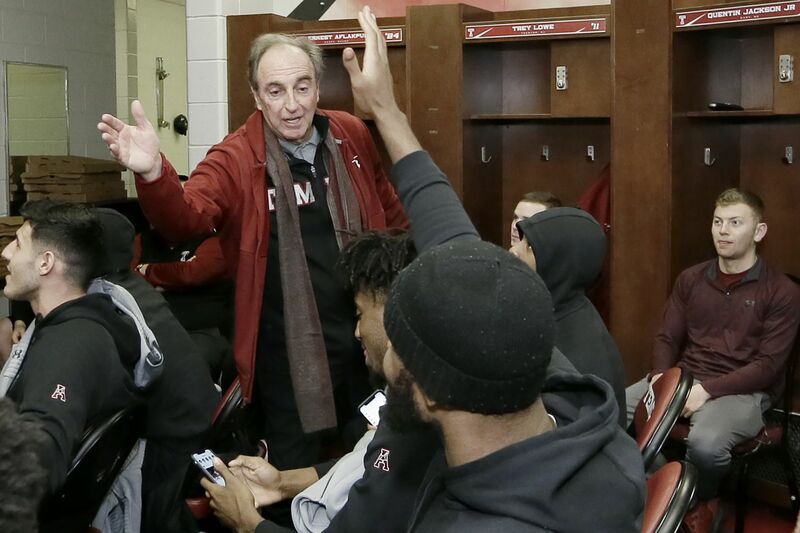 Temple head coach Fran Dunphy high fives members of the basketball team shortly after learning they were being included in the NCAA tournament. The Owls open in Dayton as underdogs. Not only does Temple have to play its way into the full field, it has to do so as an underdog. The Owls opened up as 3.5-point underdogs to Belmont, which earned a mildly surprising at-large bid out of the Ohio Valley Conference. The Owls also had to sweat it out after losing to Wichita State in an AAC quarterfinal on Friday. SugarHouse executive Evan Davis said his book took one bet on the Owls to win the national title before the bracket was released on Sunday evening. Somebody out there is holding 10 bucks on Temple at 500-1. It’s worse for the William Hill sportsbook, which had Temple at 2000-1 and took $100 on the Owls. If Fran Dunphy pulls off one of the greatest miracles since water into wine, someone will hit for $200,000. This will be the first NCAA Tournament full sports betting is legal outside of Nevada since the Supreme Court struck down a ban last May. Every sportsbook worth its juice is offering some sort of bracket challenge. From a business standpoint, getting two teams into the NCAA Tournament will be a boost for local sportsbooks as long as Villanova and Temple stay alive. Villanova plays St. Mary’s on Thursday in Hartford, Conn. The Wildcats opened as 5-point favorites. Davis said SugarHouse was moving two betting kiosks across the casino floor to the Fishtown Hops bar in hopes of spreading out the crowd from the sportsbook. Villanova opens with a night game (7:20 p.m., TBS), but Davis is expecting bettors all day long. “As Thursday lunchtime approaches, and the first games are about to tip off, there’s going to be lots of interest,” he said. » Villanova is 20-14 against the spread, but has failed to cover three of its last four. The over has hit in their last four. » St. Mary’s has covered four of the last six, but has been an under machine with the low total coming out in eight of their last nine games. » Temple is 6-3-1 against the spread as an underdog. » Belmont had been 5-0-1 against the number before losing to Murray State in the OVC championship game. The Bruins were without Nick Muszynski’s 15 points per game. Coach Rick Byrd told Nashville’s WSMV-TV that he expects Muszynski (ankle) to play against Temple. » Guy walked into Resorts in Atlantic City recently and dropped 25 grand on the Houston Rockets to win the title (at 13-1), 25k on them to win the Western Conference (at 15-2) and $10,000 on Milwaukee to win the East (2-1). As of Sunday night, DraftKings, which runs the sharp sportsbook at Resorts, had dropped the Rockets to 10-1 to win the title and 6-1 to win the conference. Milwaukee, which lost to the Sixers on Sunday, remained at 2-1. The Sixers are 5-2 to win the East, 12-1 to win the title. » William Hill-US said that 22 percent of the wagering money to win the NCAA Tournament it had taken was on Duke. Virginia, at 13 percent, was next. It’s data stretches back to April, 2018 when it opened betting on this year’s champion. » William Hill, which operates the sportsbooks at Ocean Resort and Tropicana in Atlantic City, has a $400,000 liability out there on Cincinnati. Someone placed a $2,000 bet on the Bearcats in December to win the title at 200-1. Cincinnati won the American Conference title on Sunday and was given a 7-seed. Their odds for the NCAA championship are 100-1 as of Sunday evening.